As written by mumblecore alum Mark Duplass and conceived by his wife and collaborator Katie Aselton, Black Rock isn't the sort of survivalist horror that concerns itself with scares or exploiting genre tropes. It's a character piece and conversation drama very much interested in capturing the awkwardness and unflattering nature of human reaction and interaction, utilizing a standard "fight for your life" framework but focusing instead on how people respond to conflict and confrontation in a less than admirable, not necessarily heroic or altruistic, light. 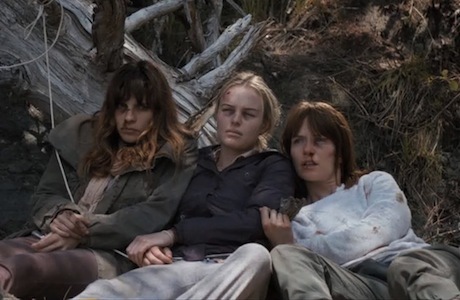 Resultantly, there's a palpable sense of unpredictability when Sarah (Kate Bosworth) reunites ex-friends Lou (Lake Bell) and Abby (Katie Aselton) for a camping trip out to a deserted island. At first, the conflict is established through passive-aggressive behaviour and furtive glances—both Lou and Abby initially refuse to partake in the event after learning that the other would be there—that eventually escalate to an emotional blowout. Sarah, able to see both sides of the situation—Lou banged Abby's boyfriend—uses reason and patience to resolve the issue, demonstrating the sort of approach to coping with hurt that is later eschewed when another conflict arises. Shortly after the trio sets up camp, three male ex-soldiers show up carrying guns, hunting on the remote island to evade laws about seasonal animal slaughter. Abby, being the loudest, most reckless member of the bunch, invites the trio to drink with them despite visible discomfort from Lou and Sarah. Once this situation gets out of control and the horror element is introduced to the tepid gender analysis, men and women are divided, each taking a distinct, intentional, approach to handling survival and vengeance. Aside from the eventual bloody, rather intense, conflict, these sequences of peril don't strive for scares. Aselton is more interested in capturing the reactions of the characters as they strategize and try to overcome panic and fear. It allows the actresses to demonstrate their abilities, vacillating between confidence and anxiety with every ruffle of a branch but, since the characters are little more than archetypal vessels for the two conflicts, acting as ciphers for an on-screen debate about gender politics, they have little to do beyond perform blanket emotions. That Black Rock isn't a conventional horror and isn't interested in subverting film theory isn't a problem at all. In fact, it's refreshing to watch something that doesn't perceive capturing "realness" as an exercise in exaggerated grittiness (there are actually several organic laughs that stem mostly from facial reactions and body language). But the three main characters simply don't have enough back-story to establish the sort of emotional tapestry necessary for a text like this to work in a connective capacity.